Welcome to the Crazy Crafters' Blog Hop with our Special Guest stamper, Georgia Giguere - we are thrilled to have Georgia join us this month and so excited to CASE (Copy And Selectively Edit) any project that has been created by her . This card of Georgia's really appealed to me! I love the layout with the wide, narrow horizontal panel of colour. I have very rarely used the spotlight technique, even though I really like the effect (one of life's little puzzles!) so that gave me another good reason to CASE this particular card. I'm completely besotted with the Beautiful You stamp set at the moment! I love it's flowing lines, the fun colouring it and the way it covers multiple occasions. Having cut my panels to size (yes, I actually planned this card! ), I positioned the long white panel directly onto the Whisper White layer and temporarily held it in place with some washi tape. I then stamped the image of the lady across the narrow panel using Basic Black ink (very similar to triple time stamping). I then separated the pieces of card, so the top of the umbrella and her ankles were stamped onto the large piece and the rest of her was on the narrow piece. 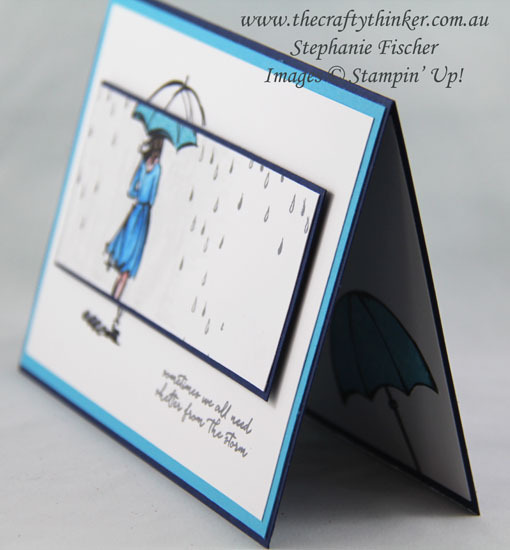 I glued a Tempting Turquoise layer to the Night of Navy card and then adhered the larger Whisper White piece (with the ankles and umbrella) onto the top. 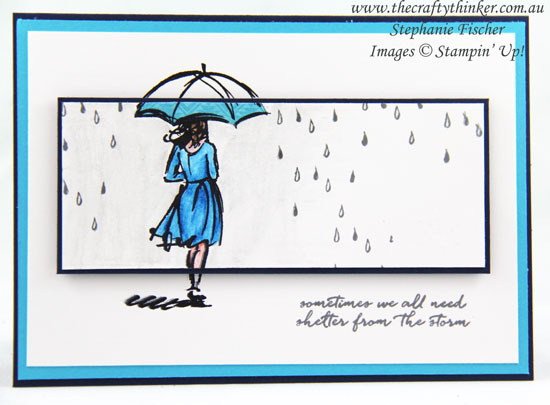 I stamped a sentiment from the Weather Together stamp set in Basic Grey ink and then turned my attention to the narrow panel. I used watercolour pencils and an aqua painter to colour the dress, hair and skin on the image on the narrow panel. I stamped the umbrella onto a piece of Festive Birthday paper, cut it out and glued it onto the umbrella image on the narrow panel. I then trimmed away any excess umbrella so that the panel remained straight. I used the grey watercolour pencil and an aqua painter to add some colour behind the image (although it doesn't show very well in the photo) and then, using Basic Grey ink, added the rain drops from the Weather Together stamp set. 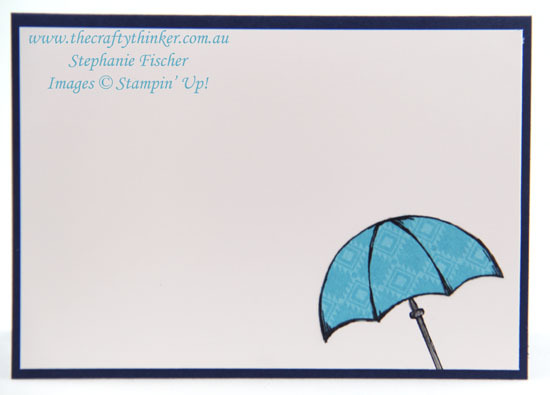 I stuck the coloured panel onto a mat of Night of Navy and then adhered the panel to the card front with Stampin' Dimensionals, carefully positioning it so that the legs and umbrella lined up.